Taylor Swift wears Ryan Reynolds' Deadpool costume for Halloween | HELLO! Taylor Swift hosted a Halloween party to remember on Monday night. The Bad Blood singer was joined by a group of her closest friends including Gigi Hadid and Martha Hunt at the party, which she shared with her fans on Instagram. While the group dressed up in an eclectic mix of costumes, Taylor went one better by wearing Ryan Reynolds' costume from Deadpool for the occasion. 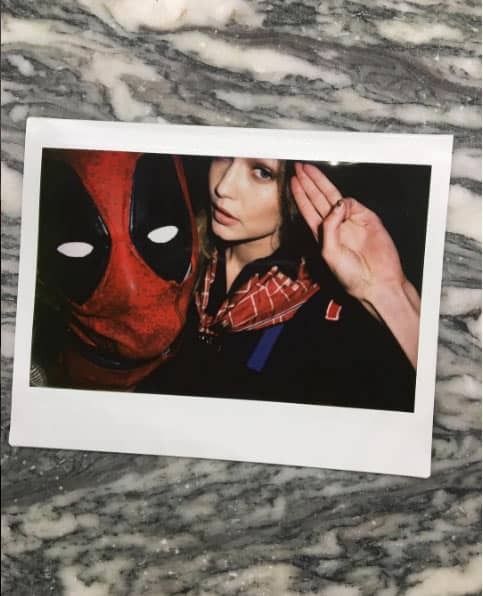 Posting a Polaroid photo of herself posing next to Gigi while wearing the antihero's red mask, Taylor wrote: "Thanks @vancityreynolds for this costume, you're the BEST deadpool inside contact ever." The 26-year-old also shared two photos of her group of friends showing off their array of costumes. They included model Martha Hunt dressed as Marsha Brady from The Brady Bunch, Gigi as a Cub Scout and Lily Donaldson as a Space Cadet. Meanwhile Fifth Harmony singer Camilla Cabello was transformed into "a granny with a lost cat", while Kennedy Raye dressed as a black cat. "Happy Halloween from Deadpool, a Cub Scout, Martha Brady, a space cadet, a granny with a lost cat, black swan and a birthday girl dressed as a cat," Taylor captioned the photo. Taylor has been spending lots of time with her star-studded squad in recent weeks, and recently headed for a girls' night out in New York with friends including Serena Williams, Cara Delevingne and Suki Waterhouse. The singer has been keeping a relatively low profile since the end of her three-month relationship with Tom Hiddleston in September, and is reportedly working on her new album – a follow-up to the worldwide hit 1989.